We spend hours in a day travelling by car. And on some days, we spend far more because of one problem or another. It could be bad traffic, a dead battery, or some other issue that extends the trip. To mitigate these headaches, we've compiled a relatively short list of car accessories that we think you should keep in your vehicle at all times. Having such a tool set would help you do some simple repairs (provided that you feel comfortable doing them) at least until you bring your car to the auto shop. All drivers experience a flat tyre sooner or later. Make sure you always have a jack to make it possible to change tyres in case it happens. There are many different kinds of jacks out there (e.g. bottle jacks, floor jacks, scissor jacks), but our favourite has to be the air hydraulic types, which raise and lower cars automatically. They may be a little pricier than regular hydraulic jacks, but their convenience and efficiency are worth the expense. These single-use tools provide a quick, convenient way to fix a flat tyre, especially when you don't have a spare or the necessary tools - like the ones mentioned above - to change the flat tyre. When the leak is plugged, you should be able to drive to the auto shop to get the problem fixed. A canned tyre inflator certainly isn't a permanent fix, but it'll protect your rims from damage. Buy the water-soluble, non-flammable variant to make it easier for the auto shop to remove the sealant from the tyre. Get a canned tyre inflator that says "tyre sensor safe" as some variants can ruin tyre sensors. You need to maintain just the right amount of tyre pressure. Put in too much air and your tyres become stiff, reducing the amount of rubber meeting the road. When this happens, your control over the car decreases and your tyres may get damaged when it runs over debris. Under-inflated tyres require the engine to use up more power, increasing fuel consumption. Plus, the vehicle is also a bit more difficult to steer. To keep your tyres properly inflated, you need to carry a pressure gauge in your car at all times. Of course, you need to actually use the device regularly to find out how much air are in your tyres. Note: the ideal pressure for every car varies depending on factors like year released, make and model. You'll find this information in the owner's manual or the car's door jamb sticker. All tyres inevitably lose air pressure. It could be caused by a change in temperature, the normal flow of air through rubber, or a leak. Because of this, carrying around a portable air compressor (aka tyre inflator) lets you maintain the right amount. It also means you won't have to look for a petrol station each time it happens. Having jumper cables isn't enough. This presumes that if your car ever breaks down, there's always someone out there with a vehicle who will lend you a hand. 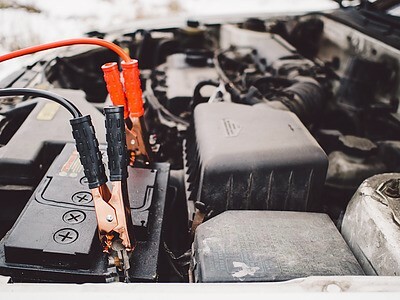 In cases when there's no one around, you'll need a jump starter, which are a lot like jumper cables. Meaning, they can also boost your car's dead battery, but without the need for another vehicle. Jump starters come in different sizes, but are portable in size. They typically range from 300 to 3,000 amp. For better reliability, aim for something with more amps, which are typically a little larger. Scrapes happen when we least expect it. If you hurt yourself while in or around your car, you'll need a first aid kit to treat injuries. It's especially helpful to have one when going on a long road trip. The first aid kit should be stored in a resealable waterproof container. Make sure you periodically check if the materials are still within their expiry date. For all the danger it brings to driving, the smartphone has become a useful accessory behind the wheel. At the very least, it doubles as a GPS navigation system and a means to control streaming music. To keep your hands off the device while driving, you'll need to install a car phone mount - ideally someplace where you won't have to look down. Because of their large screens and multitasking capabilities, smartphones today lose battery power far more quickly. You'll need a USB charger to keep your phone powered through the day. Look for one that comes with at least two USB ports so that you and your passengers can charge their phones as needed. On average, USB chargers 2.1 to 2.4 amps. See to it that the charger you buy for your car is at least equal the amperage on your phone's wall charger. If you get one with lower amps, charging will take longer. Dashcams add an extra layer of security for motorists. They don't prevent accidents from taking place, but the footage they record can serve as evidence that may help turn disputes in your favour. You can also use dashcam footage when making an insurance claim. The captured video won't necessarily be conclusive evidence but it'll certainly help. You can't use it to record private acts (e.g. inside buildings or a garage). You can't use it to record conversations - this is illegal. To avoid this, just disable the audio. Installation of the dashcam should follow your state/territory's phone/GPS mounting guidelines. ALLBIDS runs many online auctions for car accessories on a daily basis. And on each auction, we provide layers of protection, which means you can bid with confidence. So look for the right accessories at ALLBIDS today. If you're looking to sell your accessories, you can also use ALLBIDS to make the most of your return. Give us a quick phone call, message or chat to find out how.